Pápai Páriz Ferenc, Album amicorum p. 85. Proverbiorum Cap. 3. Versu 13. His peramicem comitatur, Magni Parentis desideratissimum filium Franciscum P. de Papa, pro bono communi ad exteras Academias Patriâ excessurum: unus boni votorum. Incl: Collegij Bethlen. Curator. mpr. Let this memento accompany my good friend, the beloved son of his great father, Ferenc Páriz Pápai, who in the interest of the common good sets out to foreign academies; together with all my best wishes. Count Sándor Teleki of Szék was born in 1679 a son of Mihály Teleki (1634-1690) and Judit Veér (1631-1707). He was the father of Count Sámuel Teleki (1739-1822) founder of the renowned Bibliotheca of Marosvásárhely (Târgu Mureş). After the imperial troops in 1704 and 1707 looted Nagyenyed (Aiud) and destroyed the famous Bethlen College and its library, he obtained a royal patent for collecting funds in England for the rebuilding of the college. Together with Ferenc Pápai Páriz Sen., he did much for the college, of which he became Curator. Between 1711 and 1750 he supported some 30 students on foreign stipends. From 1734 until his death he was supreme curator of the college of Marosvásárhely. In 1733 he became Councillor of the Transylvanian Government, in 1736 Councillor of the Court Chancellary of Transylvania, and later Lord Lieutenant of Torda county. In 1703 he married Júlia Bethlen of Bethlen (1686-1722), daughter of Miklós Bethlen (1642-1716). His second wife was Zsuzsanna Nagy of Petk (?-1748). Count Sándor Teleki was known as a severe and autocratic personality by his contemporaries. His youngest son Sámuel, who had lost his mother at an early age, was educated with great care by himself in his castle of Celna (Þelna). At the age of fifteen, on September 5, 1754, Sámuel lost also his father, who in his last months went to live to Gyulafehérvár (Alba Iulia), out of fear from an armed robbery against his castle. Count Teleki notes in the Album as Curator of the Bethlen College of Nagyenyed. His two brothers, László and Pál had also made their mementos in the Album in their castle of Gernyeszeg (Gorneşti) of Maros-Torda county, on July 24 and 26, respectively (pp. 73, 83). 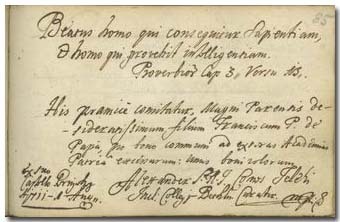 The dating of the note of Sámuel Teleki is perhaps erroneous, for on July 30 the two students, János and Mihály Teleki, as well as their tutor András Ajtai Szabó made their notes already in Kolozsvár (Cluj) (pp. 86, 87, 451). The date of death of Count Teleki is sometimes given erroneously. His son Sámuel has himself noted in his own beloved Bible: “My dear Father died in the Castle of Karlsburg [=Gyulafehérvár] Ao. 1754. d. 5-a Sept.” [Deé Nagy 14]. It is also unfounded that the renowned man of letters Péter Bod would have recommended in 1766 his Magyar Athenas to Count Teleki (who had been dead since more than a decade). His recommendation was in fact to the three young Counts of the next generation: Sámuel (1739-1822), son of Sándor, József (1738-1796), grandson of Sándor and Ádám (1740-1792), grandson of Pál [Bod, Teleki].